KAS enjoyed a wonderful evening with guest artist Rob Leckey. 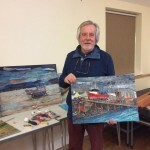 He showed us how he created his paintings, the techniques he employs and the various mediums he uses, and not a brush in sight! Rob uses a variety of tools to apply paint, ink and oil pastels to his paintings using pieces of stick, credit cards, cardboard and anything else he can make a mark with. The painting literally evolved before our eyes. Thanks Rob for coming to Kidderminster Art Society and entertaining and educating us!